Why it’s essential to track your health? Thanks to an increasing number of ever-evolving fitness trackers and medical devices, technology is rapidly changing how we monitor our activities and overall health. With the rise of health tracking technology, it is now much easier for the average person to keep tabs on their personal health data. The quality of sleep you’re getting, the calories you’re burning, and your heart rate are all strong indicators of your current health and understanding and managing them can help to prevent illness and extend longevity. With a few simple technological tools, you can monitor this information and use your findings to take crucial steps towards improving and maintaining your health and, as a result, your life. Are you feeling bad? Is your performance slipping? Then you may need to keep closer track of your health. Like everything else, your health starts to make sense when you look at the numbers. Living a “healthy lifestyle” might actually mean living a lie if you don’t do this. A healthy lifestyle isn’t something you “switch on or off” on demand. It’s called a “lifestyle” for a reason – it’s something you do day in and day out. By monitoring your heart rate, you will know whether to speed things up or slow things down during your workout. By counting your calories, you can judge whether or not you really need that dessert. A lifestyle tracker is there to nudge, remind and push you in the direction of a healthier lifestyle. Arming yourself with this information helps you to see how you can spend your time achieving more. Whether it’s walking a few extra steps each day, getting up out of your office chair more often or taking stairs instead of the lift, understanding where you can make changes easily will entice you to lead a better life. 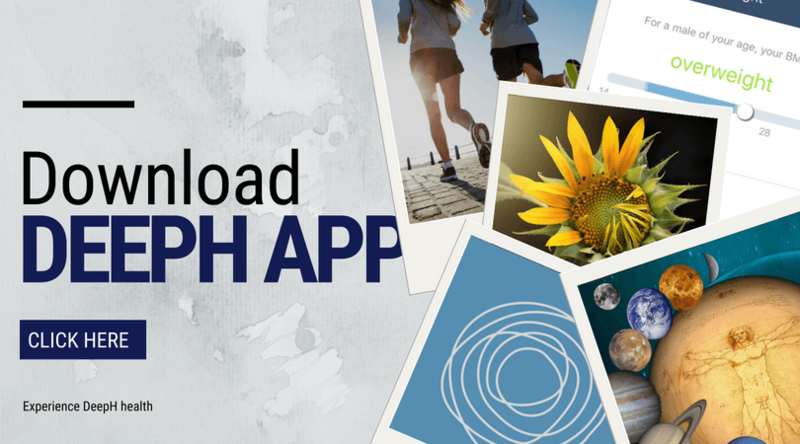 DeepH has developed an easy to use innovative app to help everyone understand their personal health, take control of their health journey, and help contribute to improving the health of everyone. Even if you are not a fitness fanatic and working out seems like a challenge, you still need to track the steps you take, the calories you burn, your sleep duration, and control your blood pressure, at least some of the time. With the DeepH app, you can do all of that in one place. The DeepH App collects your fitness data from different sources and also enables you to manually add information about your blood pressure and blood glucose levels. DeepH will then give you immediate feedback on your parameters telling you whether or not they are normal according to your age group. DeepH can also help you to control the number of cigarettes you’ve smoked, how long you meditate for and allows you to see your health score change as you improve. Increases in daily activity can come from small changes made throughout your day, such as walking or cycling instead of using the car; getting off a tram, train or bus a stop earlier and walking the rest of the way, or walking the children to school. Self-improvement isn’t a destination. You’re never done. Even when you have successes, if you want to maintain them, then you have to keep doing the things you were doing that got you there in the first place. How do you want to look and feel by this time next year? If your goal is to be thinner, happier, or healthier, you can achieve it by making small adjustments to your lifestyle. Tiny changes can have a surprisingly significant impact.